1993 spielte das Ensemble Huun-Huur-Tu erstmals in Amerika und erzielte binnen kurzer Zeit überwältigende Erfolge. Ihr "Khoomei" oder "Throat singing" - wie die Amerikaner sagen, der Obertongesang ist eine der faszinierendsten Vokaltechniken der Welt. Schnell erreichte das Ensemble einen "Kultstatus" in der neuen Welt, veröffentlichte dort mittlerweile sechs CD's und erfreut sich weiter wachsender Popularität. Die Kultur der Tuvenen ist der mongolischen verwandt und spiegelt den Respekt vor der Natur wieder. Huun-Huur-Tu spielte im Amerika u. a. zusammen mit dem Kronos Quartet, Frank Zappa - dem sie das Lied "Ching Söörtükchülerining Yryzy" (Song of the Caravan Drivers) gewidmet haben - , den Chieftains und L. Shankar. Huun-Huur-Tu Stil Unüberhörbar gibt es einen rituellen Charakter in dieser Musik, aber alle meditativen Tendenzen tilgt Huun-Huur-Tu durch eine stark rhythmische Ausrichtung. Zutiefst geheimnisvoll bleibt dieser faszinierende Obertongesang, der bis zu drei Melodien gleichzeitig erklingen lassen kann. Während die Mitglieder von Huun-Huur-Tu sich dem Lernen alter Lieder und Melodien verschrieben haben, zeigen ihre Konzerte die Bedeutung von Tradition und Innovation. So ist es das Anliegen von Huun-Huur-Tu etwas Neues für Tuva: Traditionell wurde tuvenische Musik meist von Solisten vorgetragen und Musiker spezialisierten sich auf ein bestimmtes Genre oder einen Stil. Diese Genres und Stile wiederum haben ihren Ursprung in bestimmten sozialen Anlässen. Huun-Huur-Tu's eklektische Aufführungen alter Lieder und Melodien dagegen bewegen sich zwischen allen Stühlen tuvenischen Musiklebens. "Wenn eine musikalische Tradition aufhört sich weiterzuentwickeln, ist sie zum Sterben verurteilt." Ted Levin "Wir haben Lieder wiederentdeckt, die niemand mehr singt. Wir lernen von den alten Leuten, spielen sogar die tuvenische Internationale, die in den 30iger Jahren sehr populär war, als Tuva eine selbstständige Republik war (Tanna Tuva genannt). Der Text ist zwar sowjetisch, aber die Melodie kommt von einem tuvenischen Volkslied." 1992, Huun-Huur-Tu was founded by Sasha Bapa, his brother, Sayan, and two other musicians, Kaigal-ool Khovalyg and Albert Kuvezin. Ever since they have tried to focus on the performance of “old and forgotten songs”, as Sasha put it. Sasha, Sayan, and Kaigal-ool were refugees of one of the large state-managed song and dance ensembles that became fixed institutions of the public cultural life during the Soviet era. For decades these ensembles with their glitzy performances of folk music or pseudo folk music offered the only possibility for young musicians to play indigenous music for a living. Throughout the privatization of the music business in the former Soviet Union, many musicians decided to abandon these state ensembles and form their own groups. The musical results have decidedly been mixed.In an interview for the American producer and critic, Ted Levin, Sasha Bapa explained the meaning of 'Huun-Huur-Tu' as the vertical separation of light rays that one often see out on the grasslands just after sunrise or just before sunset. It seems to be a metaphor for the band's key element- throat-singing that "consists of producing a deep tone in such a way as to create one or two substantial harmonics. The first harmonic is a humming sound in the mid-range, and on top is a loud whistling tone that the singer raises and lowers to create a weird sort of melody by varying the embouchure" (Jon Sobel, Blogcritics Magazine). In this light and through their heavy touring, Huur-Tu can truly be seen as a leading force in popularizing throat singing or khöömei the past decades.However rooted in Tuvan traditions, it would be a mistake to attribute Huun-Huur-Tu to a folk ensemble. For the first time, Huun-Huur-Tu laced in the pop charts with a remix of the title "Eki Attar". It became Greece's No.1 hit in the summer of 2002. The ensemble then went on to release a studio project entitled 'Spirits of Tuva' with Djs of various nationalities. They have performed with Ry Cooder, Frank Zappa, The Chieftains, Johnny "Guitar" Watson, Kronos Quartet and L. Shankar among the others. The ensemble's collaborations do also include other members of JARO: Hazmat Modine, The Bulgarian Voices- Angelite, and Moscow Art Trio.Huun-Huur-Tu's StyleHuun-Huur-Tu's style could be best described as profoundly mysterious. This comes as a consequence of their traditional, ritual laryngeal chants descending from Central Asian land of Tuva. This unique song technique reside on developing an enthralling sound cosmos rich in undertones and overtone .The members of Huun-Huur-Tu have devoted themselves to learning oId songs and tunes, but at the same time their performances reflect the values of globalization. The whistling of the high-mountain wind forms eerie overtones and postmodern statement. The repeated thrum of a string against wood and hide turns into a meditative, evocative figure straight from the avant-garde. The descendants of isolated Siberian herdsmen make serious, strangely universal music out of some of the planets quirkiest acoustics.The Tuvan acoustic quartet Huun Huur Tu prove that Tuvan music can take plenty of intelligent innovation. Using traditional instruments and drawing subtly on 20th-century composers, Huun Huur Tu transform ancient songs into complex acoustic compositions.Huun-Huur-Tu's PerformanceAs they began touring in the West, Huun Huur Tu almost single-handedly introduced the outside world to the boundless wealth of Tuvan traditions, thanks in great part to their superior musicianship. Hailing from the high pastures of the Altai Mountains in south central Siberia, the musicians have spent decades honing the overtone singing, instrumental approaches, and vibrant songs of their home.Steeped in Tuvan folklore, the ensemble wears traditional garb and accompanies themselves on string and percussion instruments, playing galloping rhythms that evoke the vast south Siberian steppe. 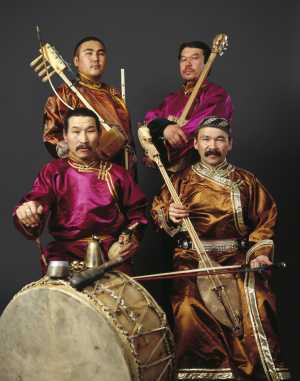 Their tightly structured pieces often imitate natural sounds, so that a song can be a literal representation of a Tuvan landscape.Jon Sobel of the Blogcritics Magazine characterized the ensemble's live performance as: "[...] the music is as warmly human as any folk style, and it's not all khoomei. The four men have six or seven very distinct singing voices among them. Accompanying themselves on plucked and bowed stringed instruments, percussion, and jaw harps, they emulate biological rhythms in song: heartbeats, breathing, a brain drifting in dreamland, and not least (for a nomadic people), a horse's trot. The songs are about romantic love, love of place, and (not least) horses, with moods that range from lyrical and thoughtful to joyful, humorous and danceable." In this sense, the San Francisco Bay Guardian concluded that the Tuvan show: "will ride into your brain and leave hoof-prints up and down your spine."